Fans of the latest in consumer router technology are abuzz about NETGEAR's latest additions, the WNDR3800 and WNDR4500. NETGEAR sent the WNDR3800 first, so that's what I'm looking at this time. Stay tuned for the WNDR4500 soon. 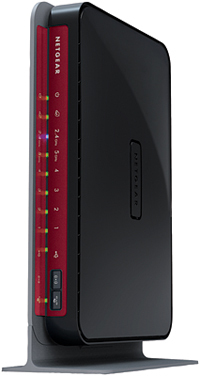 The WNDR3800 looks just like its predecessor, the WNDR3700v2, except for a sporty red front panel band as shown in Figure 1. In fact, the 3800's hardware platform is almost identical to the 3700v2's, which I'll get to in a bit. The key difference is that NETGEAR has packed the 3800 with as many features as would fit and gave it an entirely revamped admin interface. The rear panel diagram in Figure 2 shows the same Gigabit port complement as the WNDR3700v2 that includes one USB 2.0 port. The 3800's USB port is more talented than the 3700v2's, adding USB printer sharing. Drive sharing features have been enhanced with a UPnP / DLNA server and remote-access "cloud" sharing. As noted above, the 3800's hardware is virtually the same as the 3700v2's. In fact, they share the same FCC ID (PY308300092), so the RF design must be the same. The only difference is that the 3800's RAM has been doubled from the 3700v2's, to 128 MB. Flash stays the same as the v2 at 16 MB, which was doubled from the 3700v1. I've summarized the key components in Table 1. Note that neither radio has external power amplifiers. Check out internal board shots in the WNDR3700v2 review. Craig Ellison will have a complete feature review of the WNDR3800 in a week or so [done], since there are a few new things such as ReadySHARE Printer sharing, ReadySHARE Cloud and OpenDNS based parental controls. There is also a new Clear Channel selector that continuously monitors for neighboring network interference and automatically changes channel to avoid it. NETGEAR is trying an interesting strategy in its wireless product line by having two top-of-line products. The company's marketing message for the WNDR3800 and 4500 is that you should choose the 3800 if you want the most features and the 4500 if you want the highest performance. This puts buyers in an interesting position since spending the most money (for the 4500) doesn't get you the most goodies as shown in Figure 3. I'll give you a taste of the new NETGEAR Genie user interface that Craig will review in detail. Two things that you should be aware of right now. is that WEP support has been completely removed from the 3800. First, WEP is available only if you select 802.11b/g compatible Up to 54 Mbps mode. According to NETGEAR, this is now a requirement (removal of WEP support from high-throughput modes) for Wi-Fi Certification. Second, IPv6 support has been added for WAN connections with Auto Detect, Auto Config, 6to4 Tunnel, Pass through, Fixed IP, DHCP and PPPoE types. There is no IPv6 support on the router LAN side in its DHCP server, however.